The view of spik from the cycle pathLocated in the perfect position at the base of the 2864m high Triglav Mountain the options for walking and hiking from the house could not be more extensive. The country has a sytem of walks – 7000m in total that are clearly marked and mapped. The E6 and E7 European Hiking Trails go through Slovenia and the Alpine Assocition of Slovenia located in Ljubjana www.pzs.si is the umbrella organisation of the 235 local hiking and climbing clubs. They can organise mountain guides, publish many maps, publish weather conditions, hut and refuge information . THERE ARE SIMPLY TOO MANY WALKS AND TREKS TO MENTION! Our friends Roy and Justy (who live in the village) have written several books, published by Cicerone, on walking in Slovenia. Each guide has walks for various abilities and are excellently laid out and researched. They can be purchased here. You can buy a fairly detailed walking map (Kranjska Gora) from the tourist office. The books have 4 different levels of walks of various durations. Rather than duplicate their fine work, we offer a few easy walks that are too short to get a mention. Slap Pericnik (1 hour each way) following the river to the waterfall. There is a Kotcha for drinks and food (open in the summer). Once at the waterfall you can take a circular walk up to the main waterfall where you can walk underneath the main fall. If you carry on up, there is a 2nd waterfall. it. Do not swim in this lake as it was a lot of weed in it but it's okay to paddle. n come back the same way or take route 16 which will take you round in a longer loop back to the river. Dovje (1 hour) Walk downstream to the bridge and turn left. Once over the bridge turn tight and head up to the main road and cross at the traffic lights. Once over the road take in the statue of Jakob Aljaž pointing towards Triglav (He purchased it to save it for the people) and the metal relief of all the local peaks. Continue up to Dovje village and turn right at the junction. This will take you to the square. If you continue northwards you will come to a footpath which takes you through a farm and then turns right through some fields. looking right you get an excellent view of Triglav and the other peaks. Continue along the path to the road and then turn left and walk back down to Dovje village square. retrace your route back to the house. Whilst, as you would expect, there are many climbs in the area the biggest draw is Slovenia’s highest mountain: Triglav. It is, however, not the most difficult and most people, providing they are fit, have a guide and the right equipment,will be able to find a way to the top. There are several gateways to Mount Triglav with perhaps the easiest being from the Bohinj side. However, there are two approaches from Mojstrana. Both are more beautiful but both are more difficult. 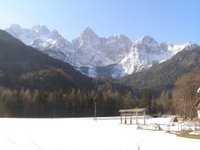 Without going into all the details, which can be gleaned from How to Climb Triglav or An Alpine Guide, the easiest route ascends through the Kot Valley, which is accessible by road 3km south of Mojstrana. The road (and then trail) goes essentially due south past a meadow called Lengarjev Rovt, a spring and a big bowl called Pekel below Vrbanova Spica (2299 metres) before reaching the Dom Valentina Stanicev at 2332 metres and it takes about five hours to reach. The hut has 78 beds. Triglavski Dom na Kredarici, the main hut serving the northern routes, and at 2515 metres the highest accommodation in the land, is an hour away and the summit still another hour. While Triglavski Dom has 126 beds, it is often full; the best idea is to spend the night at Stanicev Dom and make the ascent in the morning. A more difficult ascent is possible via the Tominsek Trail through the Vrata Valley, passing Aljaiev Dom v Vratih, a 180-bed hut at 1015 metres. The hut can be reached by car from Mojstrana (11 km) but the gradient is very steep in parts. Walking should take about three hours, including a look at Pericnik Waterfall. You'll probably want to spend the night here as it is among the most beautiful sites in the park, with a perfect view of Triglav's north face. Nearby is a 10-metre boulder called Mali Triglav (Little Triglav) where you can practise your ascent of the Big One. From Aljazev Dom, it's a 3h.30min walk via the north-west flank of Cmir and below Begunjski Vrh to a spring with excellent drinking water. From the spring you can choose whether to walk to Stanicev Dom, 30 minutes to the southwest, or to Triglavski Dom, an hour to the south. Note that part of this trail is via ferrata and you will need the correct equipment. One can then choose to head back or to take the route back to Bohinj and arrange transport from there. Ice climbing is popular at the Gorge near the tennis courts. Tourist information can find you a tutor. Mojstrana hosts an annual ice climbing event and in 2009 held the world ice climbing championships. Climbing takes place in a natural gorge with artificially made ice. The height of the ice wall is from 20 to 40m. The Adventure Park at the top of the chair lift at Bled provides the opportunity for children age 4 - adult to use harnesses and climb through the trees in a "Go Ape' platform / rope experience. Children can also climb at climbing walls located in various places including by Lake Bohinj.